Bursting full of Iron, vitamins and minerals, Super Supplement Red Blood is a specially designed supplement promoting optimal circulatory function. Containing Yucca and Kelp, Super Supplement Red Blood uses natural ingredients to help reduce essential mineral deficiencies like Anaemia, thus encouraging oxygenation of the blood and as a result facilitating maximum performance and well as rapid recovery. 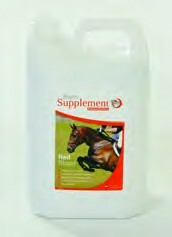 There are currently no questions for Super Supplement Red Blood for Horses - be the first to ask one!